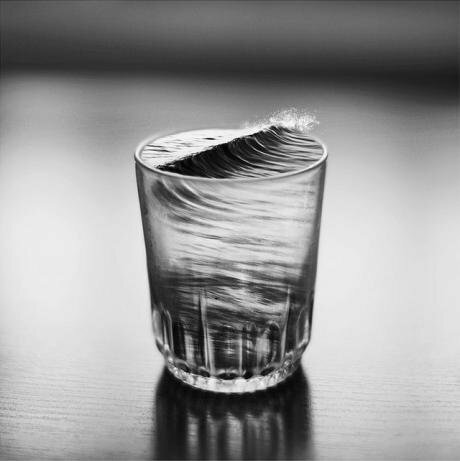 Waves can occur in a glass of water, thanks to surrealism. Silvia Grav. All rights reserved.Post truth and fake news are the current hip terms circulating in the public sphere that are being used both as a tool for attack on, and an explanation for the current state of regress of democratic values and civil liberties. The spread of hateful sentiments and the rise in violence against various minority groups is very often put down to the proliferation of fake news and populist narratives. It seems that the common strategy of resistance is the provision of facts. Civil societies and individuals alike are trying to resist and reverse fake news by providing evidence-based information. Initiatives like the Anti-Rumour Campaign from Barcelona were replicated in many cities across the world, to tackle the myths and misconceptions about migrants and refugees with ‘real’ facts. Many people, including myself, are regularly posting statistics, charts, and photos of the ‘real’ facts, to respond to instances of fake news appearing on our Facebook walls. This strategy seems pretty logical, right? Fake news could/should only be trumped by real news based on the truth. And what is real and true? Facts. We just need to figure out how to seek better, more convincing facts, and how to do it in a real time to respond to the fast pace of ever-emerging fake news. Problem solved. The problem is however, that facts do not matter. At least not in the ongoing war between fake news and evidence-based information. Facts per se, scientifically researched and measured numbers and data, exist in a vacuum. Facts, numbers and data do not describe or explain the reality as such; they just give an isolated snapshot of a particular phenomenon. Facts, number, and data need to be interpreted before becoming a communicable narrative reflecting reality. And when facts are interpreted then they relate to measures of truthfulness other than science or expertise. A classic example of this catch is the never-ending dispute about a glass that is either half full or half empty. Both options are true, but neither of them is a fact. The scientific fact in this case is; a glass of a capacity let’s say 250ml is filled with 125ml of liquid. The capacity of the glass and the quantity of the liquid have both been measured: these are the facts. But when we argue about the state of the glass in question, we do not discuss facts sensu stricto but concepts that are based upon the interpretation of facts. Facts, numbers, and data are dry and boring; it is easy to forget them or to mix them up. Apart from a small group of people, usually academics, who love the intellectual exercise of discussing research methodologies and fact collecting, ordinary people are neither interested nor have they time to analyse the epistemology of facts. The only thing that people want, is to know; who are the goodies, and who are the baddies? And that is what populism and fake news do. They give a clear-cut version of the good and the bad, presenting clarity in the chaos of contradictory information and ideas. Fake news not only tell people that ‘we’ are the goodies and ‘they’ are the baddies, but they also give a purchase on the future by transforming current events and past experiences into one coherent perception of what it will mean to uphold (or lose) power. ‘Us’ ‘them’ ‘power’ ‘right/wrong way’ these are all concepts expressed by a narrative, and they are not facts. We can say that the role of fake news is to reinforce power by matching concepts with ideologies. Populist narratives and fake news in most cases are created by people who want to uphold the status quo that revolves around a dominant concept of prescribed identity, creating a clear cut division between ‘us’ and ‘them’. In this simple formula for fake news ‘us’ are the people who look, talk, behave and pray the same way. Our way is the right and safe way, but ‘they’ want to take it away from us. Whereas, the other side is asking us to make room for ‘them’ because ‘they’ are part of ‘us’, and they say that this sharing of power is cool. ‘Us’ ‘them’ ‘power’ ‘right/wrong way’ these are all concepts expressed by a narrative, and they are not facts. Concepts more than facts are grabbing people’s attention because concepts are directly related to emotions and values. Emotions and values are what people care most about because they guide people’s aspirations, hopes, and fears and influence the way people perceive struggles and disappointments. That is why fake news is taking off like wildfire, because it is designed to play on people’s emotions and values, to raise their hopes of winning their subjective struggle, whatever that struggle may be. How can you fight subjective narratives of hope, fear, or self-hatred with objective facts? Fake news also validates people’s fears against failed aspirations, whatever they have aspired to become or to have. That is why fighting fake news with facts is pointless because, how can you fight subjective narratives of hope, fear, or self-hatred with objective facts? Objective facts very often have rather little relevance to the reality of people’s lived experiences, everyday real live experiences can be better expressed by narratives. So narratives matter and concepts matter, as well as contexts. Why is context another key element? Let me go back to the case study of a glass filled with liquid. The argument whether the glass is half full or half empty is not a philosophical question about people’s positive or negative attitudes. People take sides depending on the context that they are situated in, and that is a pragmatic decision. If a person is thirsty then the glass if half empty, if a person is not thirsty then the glass can be half full. One concept can have a few different meanings for different people, depending on the context that they are positioned in. The issue of fake new is particularly worrying in the context of making social policy and laws because, fake news can very easily create a sense of urgency and need for intervention, tinted with feelings of threat or the danger of losing power. And when people feel that they are under a threat they act accordingly, to uphold the status quo. And politicians and policy makers are not exempt from the perception of feeling that they may be under threat. They are not individuals hanging in a vacuum thanks to their position as decision makers; they are architects of the society but they are also a product of the very same society. They hold beliefs and opinions that correlate with their upbringing, education, life experiences and access to information. And these beliefs and opinions form a prism through which they are interpreting the facts to form concepts. In the absence of an effective counter-narrative to fake news, the political class is being pulled in one direction by the dominance of hateful and stigmatising populist narrative in media coverage and fake news in social media debate. What is more, politicians are being elected by members of the public based on their political platform that is not built on facts but on concepts, emotions and values that they share with members of the public. Therefore this is a self-perpetuating cycle of action and reaction that needs to be addressed as a whole. To influence policymaking we need to engage with both policy makers and the society at large, to break the cycle and restart it with concepts and narratives of democratic values of equality and human rights at its core. The question is then how to build an effective counter-narrative to fake news? Definitely not by a provision of facts, but by engaging with concepts, emotions, and values. First we need to unpack the meaning of concepts that operate in the society, and we need to investigate how these concepts re/produce misconception, inequalities, and oppression in contemporary societies and what emotions they instigate in people. Concepts are schematically organised depictions and attitudes with regard to certain aspects of the world. Unpacking concepts and realising their contexts means understanding the hidden or unconscious motivations in others and ourselves too. This will enable us to address concrete problems – not by providing indisputable answers, but by challenging the populist application of concepts. Confronting and demystifying ideologies can’t happen through the systematic investigation of semiotic data but by systematic investigation of concepts and contexts to build better narratives. Therefore my argument is that it is not the facts per se that we should focus on when tackling fake news, but it is the concepts and contexts that are important to be attentive to. Concepts convey values and emotions, and context is the pragmatic framework where the concepts take root. Fake news are playing with them, and we should enter that game too. Not to twist or stretch concepts and contexts to fit our purpose, but rather to protect them from the distorted twisting and stretching that they are subjected to by fake news and populist narratives. We don’t need better facts, we need better interpretation of facts. We also need to reconnect concepts with democratic values of equality and human rights and we need to be mindful of the particular context that people live in. To achieve that we need better communication strategy, a strategy that works both ways. As civil societies we can’t only ‘lecture’ people about values of equality, inclusiveness, social justice, and human rights. We also need to provide channels through which people can voice their concerns without being afraid of being shut down at a first sign of a discrepancy with values that are perceived as at the core of well-being for our societies. Without knowing what people’s concerns are, and context their concerns reflect, it is quite impossible to unpack the concepts and build them back up with a new, emancipatory meaning. Teresa Buczkowska at the World Forum for Democracy 2017, on November 9. Council of Europe/ Klara Beck. All rights reserved.The war between populist narratives and evidence-based information is currently being won by fake news not because of its ability to connect with peoples’ emotions and concerns, but because of the inability of the other side to do the same. And that’s how a large part of the society is being lost to the populist application of concepts and their ideology of division. People have emotions and concerns, and they want to voice them, not to spread hate, but to find reassurance that their concerns will not become their reality. And this is the space for the two way channel of communication that is not reacting with facts, but is responding with a vision of a collective future of ‘us’ where everyone deserves their glass of water.